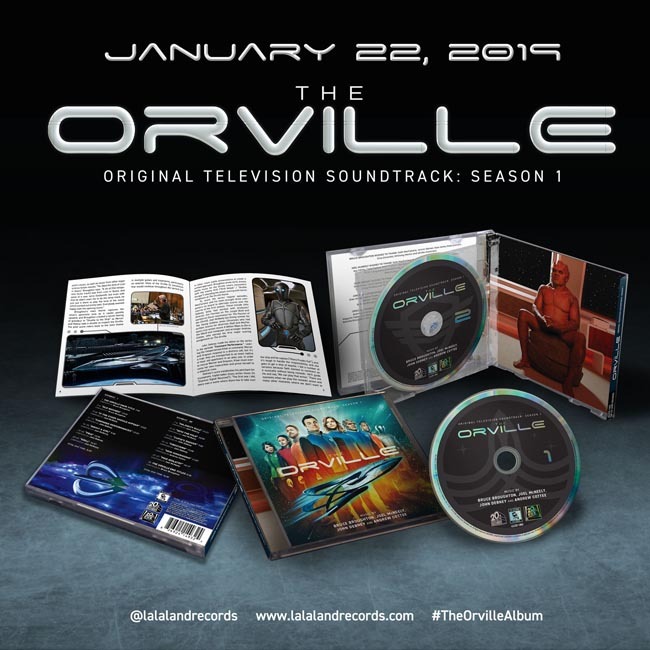 La-La Land Records, 20th Century Fox TV Records and 20th Century Fox Television present THE ORVILLE – ORIGINAL TELEVISION SOUNDTRACK: SEASON 1, music by Bruce Broughton, Joel McNeely, John Debney and Andrew Cottee. This deluxe 2-CD presentation contains the astounding orchestral score highlights from the first season of the acclaimed hit television series. Thematic, dramatic, suspenseful and full of heart and wonder, these soaring episode scores are vital to THE ORVILLE’S missions, as its ship’s crew, both human and alien, face the wonders and dangers of outer space, while also dealing with the problems of everyday life. Produced by Dan Goldwasser, Bruce Broughton, Joel McNeely, John Debney and Andrew Cottee, this 2-CD presentation is mastered by Pat Sullivan at Bernie Grundman Mastering and is art designed by Goldwasser, with exclusive, in-depth liner notes by writer Jeff Bond.